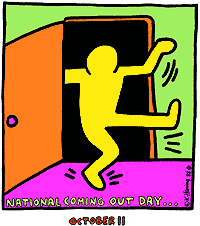 Today, October 11, is National Coming Out Day. This annual celebration was founded in 1988 by psychologist and activist Robert Eichberg and Jean O’Leary, an LGBT activist who was the head of an organization called the National Gay Rights Advocates. October 11 was chosen because it was the date of the 1987 March on Washington for Lesbian and Gay Rights, where half a million people demanded equal rights for the LGBT community in only the second such demonstration in our movement’s history. 18 states participated in the first NCOD; just two years later the day was celebrated in all 5o states and 7 other countries. I came out for the first time, to a gay friend in my high school, in 1999 — 13 years ago — and came fully out of the closet 9 years ago in 2003. Although the coming-out process wasn’t always an easy one, I’ve never once regretted my decision to embrace and love my authentic self and own the truth of my identity as a gay man and a proud member of the LGBT community. But as I wrote earlier this summer in a column about Anderson Cooper’s coming out, the decision to come out of the closet isn’t just personally liberating — it helps make the entire LGBT community more visible and brings us just a little bit closer to full equality. Breaking our silence and telling our stories is how the movement for LGBT civil rights has achieved so much so quickly. Keeping our lives, loves, and relationships private only perpetuates the shame of the cultural closet and postpones our equality. Gay hero Harvey Milk once said that the LGBT community “will not win our rights by staying silently in our closets.” I believe that Milk was right: Coming out is the single most important thing LGBT people can do in the struggle for our civil rights and human dignity. So I’d like to echo his words and encourage everyone — LGBT people and allies alike — to come out, provided that they feel ready and that it’s safe to do so. Closets, even glass ones, are simply not places where people can fully embrace and be true to themselves. The hours and minutes before I said those words — “I’m gay” — for the first time were probably the most vulnerable and frightening moments of my entire life. And I’m not going to pretend that all of the comings-out that followed were a picnic, either — I don’t just work with victims of anti-LGBT bigotry, I’ve experienced its sting firsthand in my community, from people I thought were my friends, and even from members of my family. But would I go back to the person I was before I came out of the closet? Hell no. I’m out, I’m proud, and I’m never going back. I hope you are too. If you’re not yet able to be out, I hope your journey will one day take you there.